One of the toughest lessons to learn as a child is how to fit into the construction called “society.” Getting children to think about their social responsibility requires them to understand how the world works, and where their existence factors into the imagined community of local, national, or even global society. Fraggle Rock isn’t immediately obvious as a show about community, particularly to younger viewers. At first glance, it seems to be a show about furry creatures who live under the ground and have funny hair and humorous names like Gobo and Wembley, and about their close encounters with the enormous Gorgs or the fierce canine who guards the entrance to “Outer Space”—also known as reality—with his “silly creature” owner, Doc. The Doozers are the funny green animatronics whose commitment to work offers a humorous counterpoint to the Fraggles’ love of play, and the talking Trash Heap’s sage wisdom is simply an excuse for a catchy tune. Although this co-production model—adopted from Sesame Street—enabled the show to make a more direct appeal to a particular culture, the basic story of each episode remained the same. The adventures of Gobo, Wembley, Mokey, Boober, and Red Fraggle were considered to be universal, free from the cultural codes of any particular nation or language. Theirs is a story of community, of how the bonds of friendship are tested and how our responsibility to those around us must be balanced with our responsibility to ourselves. None of the Fraggles have parents, or children, or even siblings. 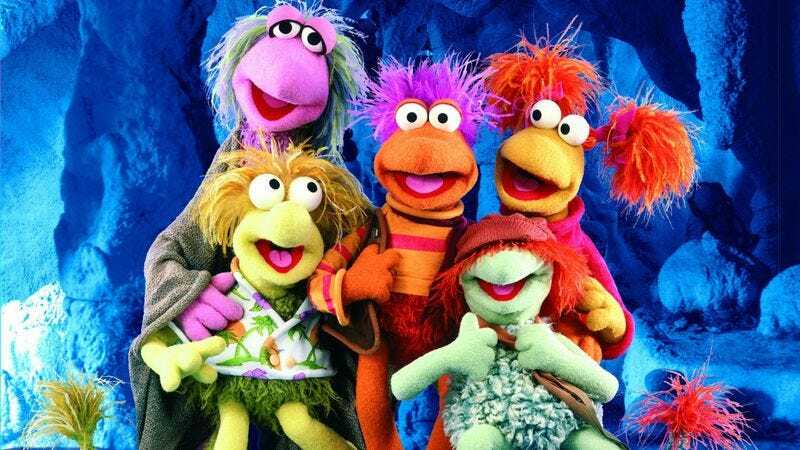 While this—combined with their penchant for dancing their cares away and leaving worries for another day—can make the show seem slight, it also amplifies their role in the social framework of their fellow Fraggles. The same goes for the Doozers and the Gorgs, who share the ecosystem of Fraggle Rock and allow the show to explore different communities along the same lines. The labor-oriented Doozers more directly address the roles people are expected to play in life, while Junior Gorg’s relationship with his parents offers the show an angle on the family unit, his coming-of-age continually delayed by his dunderheaded nature, but rescued by his well-meaning heart. In a world where characters never age, the show largely repeats the same pattern: A character loses his or her sense of identity within the community, looks within to find his or her true self, and then reconciles with the community. Like many children’s shows, each episode of Fraggle Rock has a clear message about friendship or growing up or the meaning of life, and those morals almost all rely on this pattern. However, Fraggle Rock’s legacy lies less in its morals—which are more nuanced than, but nonetheless consistent with much of today’s children’s programming—and more in its boundless creativity. Utilizing new technology like green screens and animatronics in conjunction with a wide range of puppetry (including the life-sized Gorgs, in which costumed performers work with off-screen puppeteers operating the face using animatronic controls), the show remains a wonderfully realized world that today’s largely animated children’s shows can’t match. It may not be photo-realistic, and the green-screen effects would likely stand out as poor to today’s generation of kids, but the show does a great job of communicating the scale of these interconnected universes within the production limitations of the time. Perhaps more remarkable is that every episode of Fraggle Rock becomes its own musical. The show’s songwriters, Dennis Lee and Philip Balsam, were rarely content with a single musical style, shifting based on episode or character. (Marjory the Trash Heap largely focuses on blues numbers, while Gobo is more likely to strum out of a folk ballad.) While not every song is a winner, the numbers hold up remarkably well given their age, their diversity and thematic resonance strong enough to overcome changes in taste or style in the nearly 30 years since the show began. It is no coincidence that many of the episodes listed below are those with memorable musical components. While Jim Henson was involved in the conception of the series, Fraggle Rock was largely completed under the guidance of the two Jerrys: Jerry Nelson, who played the central role of Gobo and was the most experienced Muppet performer in the full-time cast, and Jerry Juhl, who—along with Jocelyn Stevenson—shepherded the writing staff through the show’s five seasons. While other members of the creative team are still living, both Nelson and Juhl have died, and there has been no recent Fraggle content from the Jim Henson Company outside of the Ben Folds Five video for “Do It Anyway.” However, Fraggle Rock is ripe for revival, with a new film stalled after the latest of many creative reshufflings and plans for a Doozer-centric animated series moving forward. There is an enormous amount of potential in a return to Fraggle Rock, but it seems unlikely any new project will live up to the original. In an age of CGI/live-action hybrids (the planned model for the cinematic reboot), a simple story of community and friendship doesn’t have the appeal it used to, and the marketability of a puppet musical is highly dependent on the star power attached. For its 96 episodes, Fraggle Rock never depended on the whims of network executives or shifting audience tastes. It was a simple show with simple messages, which perhaps makes it too unsophisticated and episodic for a discerning modern audience. However, Fraggle Rock’s appeal nonetheless feels like more than nostalgia: It’s affecting not simply because it’s something viewers once loved as children, but also because it taps into emotions that, in spite of the show’s focus on whimsical creatures, is distinctly human. While often silly to the point of slapstick, Fraggle Rock is not a journey to a world viewers don’t understand, or a world the audience left behind as adults. Instead, it boils down the basic rules of society into the story of five friends and their coexistence with a living, breathing, musical ecosystem of creatures big and small, a world that retains its magic nearly 30 years after the series first journeyed through the hole in the wall. These 10 episodes capture that journey well, isolating the primary characters and themes Fraggle Rock explored over the course of its five seasons. “Marooned” (season one, episode 17): In the tradition of many great sitcoms, the show’s most diametrically opposed characters—energetic Red and dour Boober—are trapped by a cave-in and forced to coexist. While the episode reaches the expected conclusion that friendship outweighs any disagreements, the climax comes as Red and Boober share a truly—and surprisingly—moving scene from Karen Prell and Dave Goelz (respectively) as their oxygen starts to run low and they begin to doubt whether they’ll make it out alive. “The Minstrels” (season one, episode 18): Jim Henson took on two recurring characters over the show’s run, but Cantus the Minstrel, an esoteric musician with a penchant for speaking in riddles, was the most memorable. He was introduced here as the holder of a magical pipe, who arrives at the Rock to lead the Fraggle medley and teach Red a lesson about the dangers of stealing and the value of finding your own song. The show’s interest in music is consistent throughout the series, but this is one of the first episodes to use music as a metaphor for meaning and identity in such a direct fashion. “The Great Radish Famine” (season one, episode 19): The earliest take on Fraggle Rock’s delicate balance among the three primary universes, a theme the show returned to later in its run, this episode sees Marjory the Trash Heap devising a plan to try to make the Fraggles, Doozers, and Gorgs realize they all rely on the radishes in the Gorgs’ garden. The interaction between the three worlds increased with time, but the harmony Marjory imagines proves elusive in this instance, as each society spirals hilariously out of control without learning the lesson she intended. “Boober’s Dream” (season two, episode six): While seemingly disconnected from the fun-loving nature of Fraggles, Boober is unable to escape fun in his dreams, where his silly side manifests as the jovial Sidebottom. Along with revealing that the Fraggles were ahead of Christopher Nolan regarding dream-sharing, the episode also reframes Boober less as a curmudgeon and more as someone who would simply rather do laundry than let his silly side roam free. It’s an interesting detail the show returned to, breathing life into a character that on the surface lacked the dynamism of his companions. “All Work And All Play” (season two, episode eight): While Doozers featured prominently in earlier episodes, this was the first to delve into their society more thoroughly, introducing a young builder-to-be named Cotterpin as she fights against her culture’s expectations for her. The Doozer episodes never had the energy of the Fraggle or Gorg episodes, but their futuristic township and its cast of characters would recur on a regular basis from this point forward. “The Bells Of Fraggle Rock” (season three, episode one): Gobo’s leadership was always evident in Fraggle Rock, but it was also often undermined by his sense of entitlement, something the show showed more often than might be expected for a “hero.” Here, in what could be identified as the series’ “holiday” episode, his explorer’s spirit runs into the uncertainty of belief, raising philosophical questions about religion that reach a rather startlingly hollow—and thus meaningful—resolution. It also features a tremendous performance by the aforementioned Nelson. “The Secret Society Of Poobahs” (season three, episode 10): While never an entirely serious show, Fraggle Rock was rarely as silly as it was when focusing on the Poobahs, a secret society so secret that Mokey knows nothing about it, except that she absolutely has to be a part of it. Mokey’s kind and gentle spirit—captured so beautifully by Kathryn Mullen—was never more tested than in her earnest efforts to take the Poobahs seriously, despite the fact that they are increasingly ridiculous at every turn. The show was generally funny, but episodes like this one commit to the joke and follow through with wit and wordplay silly enough for kids and sophisticated enough for adults. “A Dark And Stormy Night” (season three, episode 21): Although many episodes would shift focus onto the Gorgs, this is one of the better ones, trapping a scared Junior alone in the castle on the same night Gobo decides to explore it for the first time. It’s a simple story about how people fear being alone, but it captures the small details—the burnt popcorn, the unknown sounds—that make being separated from family or friends seem so much more terrifying than it really is. “Change Of Address” (season five, episode 13): While not a heavily serialized show, Fraggle Rock ended with a multi-episode arc that finally brought Gobo face-to-face with Doc and Sprocket in the workshop at the entrance to “Outer Space.” When their friendship proves short-lived, the series finale turns into a whimsical take on the magic of this world, emphasizing the power of community to break down borders and bring friends together, no matter what challenges might stand in the way. It’s a fitting and moving finale to the series, brought beautifully to life by Gerry Parkes and the entire team of puppeteers. And if you like those, here’s 10 more: “Beginnings” (season one, episode one); “The Preachification Of Convincing John” (season one, episode six); “The Terrible Tunnel” (season one, episode eight); “The Challenge” (season one, episode 14); “Mokey’s Funeral” (season one, episode 22); “Uncle Matt Comes Home” (season two, episode five); “A Friend In Need” (season two, episode 10); “Sprocket’s Big Adventure” (season four, episode one); “The River Of Life” (season five, episode five); “The Gorg Who Would Be King” (season five, episode 11). Availability: A solid complete-series DVD set, including some bonus features recorded before the death of Jerry Juhl, is available from Lionsgate. The series had been streaming on Netflix, but has been pulled at present. Next week: Todd VanDerWerff. Buffy The Vampire Slayer. Let’s do this.